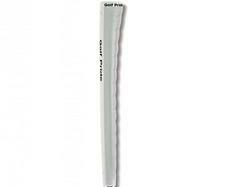 Golf Pride Players Wrap (White) Putter Grip - $9.95 - GolfersEdgeOnline.com - Best Golf Equipment On The Web! The Players Wrap putter grip combines style and touch with its smart look and innovative design. The arched-pistol shape pairs a smooth paddle front and a half wrap back in a simulated leather wrap, providing added comfort and touch on the greens. The Players Wrap also maintains well with its smooth and seamless surface that wipes clean for reliable performance. If you have any more questions about the Golf Pride Players Wrap (White) Putter Grip; do not see the model you are looking for; need custom options; or prefer to not purchase online, then please call us at (630) 656-1291.